Did You Know Hearing Aids Improve Memory? Did you know hearing aids improve memory?. Did you know hearing aids improve memory? Since hearing and cognitive health are connected, having hearing aids improve your hearing can also boost your memory and recall. As one of the body’s senses diminishes, the brain reprograms itself to adapt to the change. Read on to learn more about this fascinating discovery! Just How Do Hearing Aids Improve Memory? Back in 2011, researchers from Johns Hopkins University found that older adults suffering from hearing loss have an increased risk for also developing dementia. The chances of them developing dementia is far higher than for adults who do not suffer from hearing loss. Dementia’s most prominent symptom is memory loss. Although the exact connection is still unclear, it could be due to the brain overtaxing itself to compensate. The brain becoming overwhelmed will cause cognitive decline to begin sooner and more drastically. Hearing loss can leave those who suffer from it isolated from friends and family. This isolation in turn can cause the brain to go under-stimulated, leading to memory loss and a variety of other cognitive issues. Hearing aids can balance out stimulation levels to help keep the brain fit, active, and not overtaxed. Your brain will better remember sounds, and the associated memories, that you’ve lost the ability to sense. Maintaining normal levels of healthy brain function can forestall memory loss. What does this mean? It means that memory less won’t set in as soon or as severely. Even if memory loss does occur, it won’t be as much. Language is another aspect to memory and cognitive health. How might this be true? Studies have shown that multilingual people benefit from that ability, cognitively speaking. Multilingual speakers also display less severe cognitive decline. Hearing loss cuts off access and control to spoken words and words heard by the speakers in return. 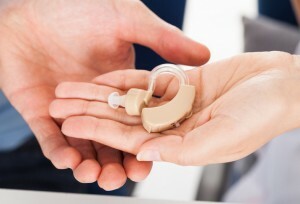 Hearing aids help maintain the cognitive and mental connections that can prevent loss of speech and speech faculties. If your hearing is declining, see a specialist right away. But if you feel that your memory is going away as well, that is a more serious problem that will require medical attention. This entry was posted on Friday, April 7th, 2017 at 1:40 pm. Both comments and pings are currently closed.